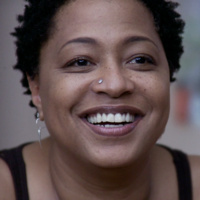 Bryant University and the President's Cultural Series present Lisa Fischer & Grand Baton at 7 p.m. Wednesday, February, 20 in the Janikies Theater. Doors open at 6:00 p.m.
After four decades of singing background for icons like the Rolling Stones, Tina Turner, Chaka Khan and Nine Inch Nails, two-time Grammy winner Lisa Fischer is stepping into the spotlight at last with her inventive new band Grand Baton. Grand Baton’s organic fusion of African, Middle Eastern, and Caribbean rhythms, psychedelic soul and progressive rock, ignites Lisa’s flexibility and freedom of expression. Join the Bryant Community for a performance not to be missed, register today! General admission: $20 Bryant Alumni: $10 if reserved in advance, $15 the night of. Smithfield residents: Receive two complimentary tickets. Additional tickets are $20. Non-Bryant students and teachers: $10 with ID. Bryant students, faculty and staff may receive two complimentary tickets which will be made available at the Fisher Student Center Information Desk (on the first floor).